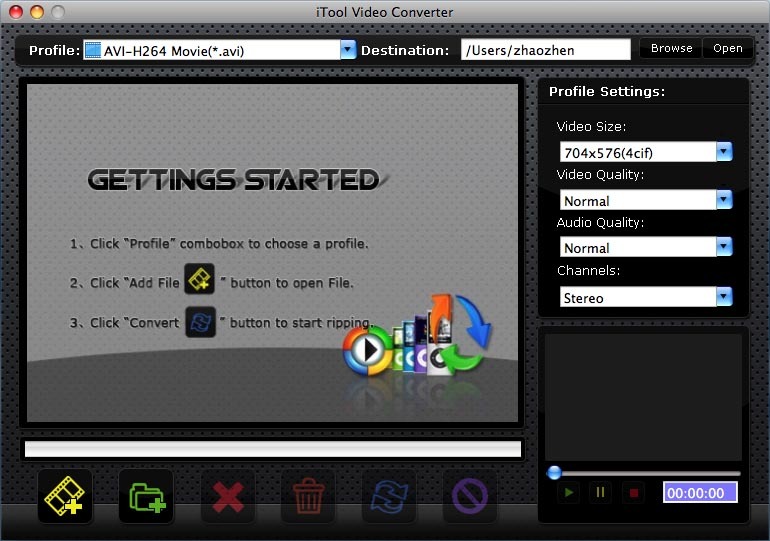 iTool Video Converter For MAC assist you in converting among the multiform video and audio files, such as convert AVI to MP4, WMV to AVI, WMV to MP4, convert AVI, WMV, MPEG files to iPod formats, etc. It allows you to enjoy high definition video on your MAC, iPod, Zune, PS3, XboX, PSP, iPhone and other devices. It has more settings you can customize, e.g. customizing video/audio files size through setting video/audio quality. Qweas is providing links to iTool Video Converter for MAC 2.00 as a courtesy, and makes no representations regarding iTool Video Converter for MAC or any other applications or any information related thereto. Any questions, complaints or claims regarding this application iTool Video Converter for MAC 2.00 must be directed to the appropriate software vendor. You may click the publisher link of iTool Video Converter for MAC on the top of this page to get more details about the vendor.